Another luxurious, leisurely start greeted us to this morning again. It’s quite comfortable here in the chalet and the rooms are rather spacious. Over breakfast in the rest camp restaurant, we discussed the pros and cons of spending more or less time in Africa before heading back to Europe. Sandy is keen to get back sooner rather than later although I would be quite happy to spend the maximum four months allowed by our air ticket. We will probably compromise by eliminating the planned trip to Dar Es Salaam and the islands of Zanzibar and Pemba in Tanzania and head instead straight for the Serengeti and Ngorongoro crater before catching a flight up to Cairo. Zanzibar was going to be a week of diving and relaxing on the beaches but since we are going to the Sinai Peninsular in Egypt anyway, this is something that we can easily cut out of the itinerary. We could always come back to Africa at the back end of our world tour. Andy turned up at our doorstep at eleven o’clock in the morning as we had planned yesterday. He would do just a little more running around for us again today but nothing like the full day of sightseeing of yesterday. Our main objective was to figure out just how to get all our curio purchases back to Europe and Andy would take us to the various airlines and shipping companies so that we could comparison shop for the best option for us. Before heading for the shipping offices near the markets, we went back up to the lodge where we had stayed with Bertie and Mags the other night. They had left some money at the lodge for Andy to collect. When we got there and spoke with the manager that was holding the money on their behalf, we were told that the money was now earmarked for some purchases that Bertie and Mags had made and in the absence of their presence to confirm anything, he was reluctant to hand it over until their return. Just observing the way in which this manager was addressing Andy, I could not help but conclude that this guy was a little jaded and somewhat weary of dealing with the likes of one of the locals. I couldn’t help wondering if this was the result of the sum of his experiences in dealing with the locals or whether this was just the way he was. I was not impressed at all and felt a little sorry for Andy, as it appeared to me that he was being denied the benefit of any doubt in the way that he was being treated. One wonders if this kind of prejudicial behaviour (if that is indeed what it was) is something that the locals put up with on a daily basis. I certainly hope not, but I rather think that it is. Off we went, then, in search of the best shipping options for our twenty-odd kilo package of nicely wrapped and packed curios. We stopped at Air Zimbabwe and several shipping companies but they were all ridiculously expensive with some of them wanting over $600. Even the cheaper ones were over $200 and their options would only get the package as far as the airport at the other end, where we would then have to worry about customs clearance and getting the package collected. After about an hour of exploring several options, I was starting to get a little despondent but then we found a shipping firm that would re-pack everything for us in a wooden crate and ship it to the destination address (Jacqueline’s house), including tracking and insurance, for just $155. We had to add another $10-$15 on top of that for the privilege of paying by traveller’s checks (we are now almost out of ready cash) but it was the bets option at this point. I was almost ready to do business with this latest shipper but we decided to try the post office again anyway just to confirm whether or not they would be able to send the package with some type of tracking. When we were at the post office yesterday, the guy behind the counter had told us that there would be no tracking possible. This was tantamount to practically giving the package away to be opened and pilfered and was considered by everyone we’ve spoken with to be a generally bad idea. We were rather pleasantly surprised at the post office to hear that there was indeed tracking of the package and not only that, but the cost of sending it would be a mere $19 (or rough equivalent in local currency). We wasted no time in handing over the huge, flattened melon shaped box and gladly forked over the ready cash. Apparently, all the backpackers that come through here use the post office to send their stuff back home also so we are somewhat hopeful that it will arrive at Jacqueline’s house some weeks from now. Since we were so low on ready cash, we decided to change up some traveller’s checks for local currency on the black market. With Andy’s help, we found a trusted source and were able to get a rate of somewhere between the bank rate and the black market rate for cash. Since we were lucky to find some means of changing traveller’s check at all, we were not too fussy about the rate of exchange. With this, we were now finished with Andy and sent him on his way with another $5 for his troubles. He was as helpful and bubbly as ever today and I still think that the money we spent on him was very well invested. We wandered around town a little looking for a bite to eat but ultimately decided that there might be some more curio purchases that we could be interested in yet and so we found a secure place to sit and evaluate our cash situation. We are desperately low on US dollars with absolutely no options for obtaining them anywhere in this country. Since you can only pay for certain things in US dollars (such as our onward transportation options out of here), we must now hoard them religiously. We don’t even have enough to pay for the $20 per person entrance fee to see the falls – although I’m not too fussed about this since we did get a good look from the bungee bridge on the border. Bertie had suggested that we use our traveller’s checks to pay for some activities such as a helicopter flight over the falls that he was interested in and that he would pay us the US dollars. The net result would be the same for him but we would benefit by effectively converting some traveller’s checks into US dollars. At this point, we aren’t sure if this is still on but we will see once they return tomorrow evening from their Chobe excursion. We still have a stash of emergency Pounds Sterling and Euros tucked away and so we decided to take some of this for use as hard currency in the markets just in case we saw something else that we couldn’t pass up. I also wanted to get some photos of the curio stalls so another run of the gauntlet seemed like a good idea. Not only did we find a few more things this time around but also I think we bought a lot more today than we did yesterday. We saw some really stunning things including some more beautifully carved animals horns, which I just had to have. Ultimately, I don’t think there are many categories of curio artwork that are now not represented in our personal collection somewhere. We bargained hard and eventually used up all the hard currency that we had decided on using and then some. Not only that but also Sandy’s socks will now be staying behind with one of the stall traders as part payment for one of the items we came away with. If we stayed there any longer, we may very well have traded the shirts off our backs – and I mean that quite literally. We not only traded with several of the marketers today but we also took the time to speak with several of them and got to know them a bit better. We exchanged names, spoke about politics and where we were all respectfully from and so on. We spoke at length with several of them whilst one of the packers (the same guy we had used yesterday and were very happy with) was diligently wrapping and packing our stuff. When not haggling with them over prices or a potential purchase but just chatting one-on-one outside of the seller/buyer relationship, you start to realise that they are just ordinary folk trying to make an honest living and are genuinely very nice people at heart. I’m convinced more than ever, now, that the Zimbabwe people are the friendliest people that exist. Some of them were happy to help us walk around the market stalls carrying our purchases for us whilst others were keeping a watchful eye on the packers and were even actively trying to make sure that everything was well packed and that we were being correctly looked after. It wasn’t for reward either; it was simply that they are genuinely nice people just trying to make ends meet and wanting to do right. Thinking back to just how desperate some of them were to make a sale by ultimately accepting almost any currency we had and even things to trade with, I can’t help feel even a bit sorry for them. After all, I bargained very hard to drive the prices for some truly stunning pieces of master craft work down to what, for me or anyone else from within my culture, was a mere pittance relatively speaking. In fact, I feel quite bad about the whole thing in a way in reflection. On the other hand, the money that I spent at the markets today is going straight back into the local economy at or very close to the source of the product’s manufacture. 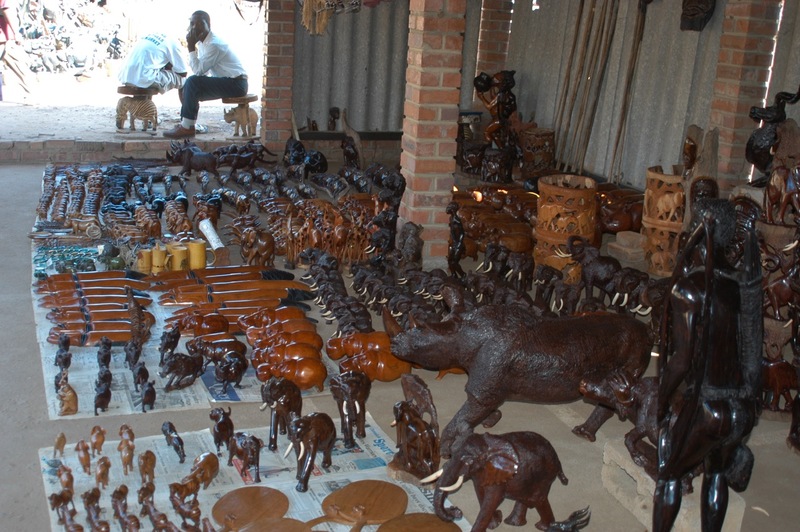 I also feel a sense of satisfaction that I was at least able to make a purchase from several traders and that because of this, perhaps, several Zimbabwe families with benefit directly from my tourist dollars (and Rand, Pounds, Euros, T-shirts, socks, books, water bags and so on). The whole thing is a bit of a double-edged sword and I’m not yet entirely convinced that I should be feeling good or bad about the whole affair but at least I came away with some spectacular souvenirs of Africa and the African people that will last for the rest of my life – and I like to think that the people I traded with got at least something in return. We went back to the post office again to repeat the process with the two additional parcels that we left the market stalls with and then went back into town to find some water and to spend a little more time on the Internet terminal at Shearwater’s. We got to talking with Warren, another one of the helpful staff employees there, and decided to try our luck at trying to arrange transport on one of the overland trucks that come through here that are transiting back up North ready to collect some more tourists. We spoke to several people today about this and generally let it be known that we were in the market for a ride up to Arusha or Nairobi. We went back to our chalet to freshen up a bit and then went back into town to Explores to take advantage of their bar specials at just Z$1000 (about US$1) a plate. After dinner, we went back to the camp-site and bumped into a couple of guides from another Wildlife truck that arrived here the other day. We got to chatting about things and I showed them our now famous series of photos of the Lion climbing the tree in Kruger National Park to capture the Baboon. They were bowled over by the photos and were very keen on getting a copy of them to hang up in their own living rooms back home. As it happens, there is apparently another Wildlife truck due to arrive soon and it will be transiting up to Nairobi in a few days from now and there is every chance that we may be able to hitch a ride with them. Since we are already Wildlife customers, he would call the office tomorrow morning to see what he could arrange on our behalf. I had originally promised Wildlife a CD full of photos for use in their next brochure so it seems like a fair exchange for a ride up on one of their trucks. We will speak with him tomorrow morning to see what the situation is.